Using infrared data from ESO’s Visible and Infrared Survey Telescope for Astronomy, this new image from the ESO reveals the stellar nursery known as NGC 6357. 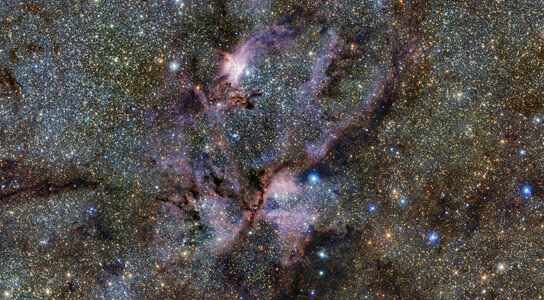 A new image from ESO’s VISTA telescope captures a celestial landscape of glowing clouds of gas and tendrils of dust surrounding hot young stars. This infrared view reveals the stellar nursery known as NGC 6357 in a surprising new light. It was taken as part of a VISTA survey that is currently scanning the Milky Way in a bid to map our galaxy’s structure and explain how it formed. Located around 8000 light-years away in the constellation of Scorpius (The Scorpion), NGC 6357 — sometimes nicknamed the Lobster Nebula  due to its appearance in visible-light images — is a region filled with vast clouds of gas and tendrils of dark dust. These clouds are forming stars, including massive hot stars which glow a brilliant blue-white in visible light. This image uses infrared data from ESO’s Visible and Infrared Survey Telescope for Astronomy (VISTA) at the Paranal Observatory in Chile. It is just a small part of a huge survey called VISTA Variables in the Vía Láctea (VVV) that is imaging the central parts of the Galaxy (eso1242). The new picture presents a drastically different view to that seen in visible-light images — such as the image taken with the 1.5-meter Danish telescope at La Silla — as infrared radiation can penetrate much of the covering of dust that shrouds the object . One of the bright young stars in NGC 6357, known as Pismis 24-1, was thought to be the most massive star known — until it was found to actually be made up of at least three huge bright stars, each with a mass of under 100 times that of our Sun. Even so, these stars are still heavyweights — some of the most massive in our Milky Way. Pismis 24-1 is the brightest object in the Pismis 24 star cluster, a bunch of stars that are all thought to have formed at the same time within NGC 6357. VISTA is the largest and most powerful survey telescope ever built, and is dedicated to surveying the sky in infrared light. The VVV survey is scanning the central bulge and some of the plane of our galaxy to create a huge dataset that will help astronomers to discover more about the origin, early life, and structure of the Milky Way. Parts of NGC 6357 have also been observed by the NASA/ESA Hubble Space Telescope (heic0619a) and ESO’s Very Large Telescope (eso1226a). Both telescopes have produced visible-light images of various parts of this region — comparing these images with this new infrared image above shows some striking differences. In the infrared the large plumes of red-hued material are much reduced, with tendrils of pale, purple gas stretching out from the nebula in different areas. The informal name of Lobster Nebula is also sometimes given to the spectacular star-forming region Messier 17 (eso0925), although that object is more often called the Omega Nebula. Infrared observations can reveal features that cannot be seen in visible-light pictures, for example because an object is too cold, obscured by thick dust, or is very distant, meaning that its light has been stretched towards the red end of the spectrum by the expansion of the Universe. 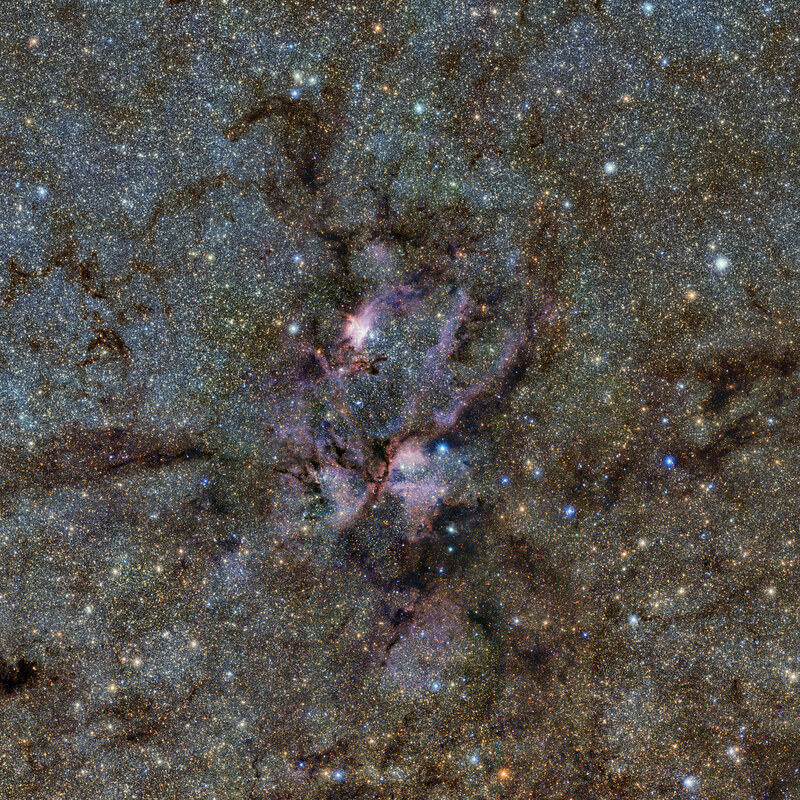 Be the first to comment on "New VISTA Image of Stellar Nursery NGC 6357"